EscrowTech India provides IP Archive services to document or evidence the subject matter of contracts, assignments, licenses, transactions, or settlements. Use this service to document, define, evidence and “freeze” intellectual property, technologies, inventions, software, works of authorship, data, products, methods, tests, encryption keys, passwords, and other subject matter that are referred to in contracts, assignments, licenses, transactions or settlements, or that are relevant to litigation, arbitration or other disputes. EscrowTech India serves as a reliable neutral that dates, stores and provides independent corroboration and evidence of the archived materials. When you draft an agreement that refers to some form of intellectual property, technology, invention, software, work of authorship, data, product, method, test, encryption key, password or other subject matter, how do you conclusively document or evidence it or its content? Six months or five years later, it may be necessary to know. What will you tell your management, client or partners if you haven’t anticipated and prepared for this? 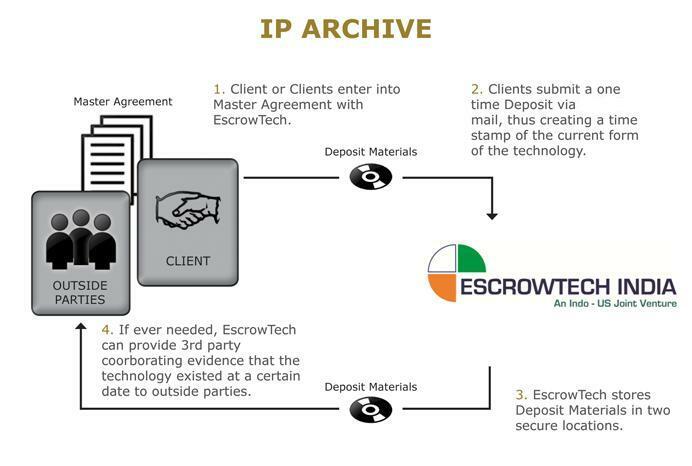 EscrowTech India’s “IP Archive” service provides the solution. One, some, or all of the parties place “Archive Materials” into an archive with EscrowTech India. Archive Materials may be in any form that documents, evidences or embodies the relevant intellectual property or other subject matter. For example, documents, drawings, electronic databases, software (source code) on CD ROMs, computers, samples, prototypes, etc. The Archived Materials are dated and securely stored by EscrowTech India in the archive. EscrowTech India ensures the integrity of the Archive Materials by prohibiting alterations of, additions to, and deletions from the Archived Materials. EscrowTech India makes the Archive Materials available for inspection, copying, release, or testing as specified in the Archive Agreement. They are also available in the event of a dispute, mediation, arbitration or litigation. EscrowTech India is a trusted and reliable neutral who provides dated independent corroboration. EscrowTech India has the facilities to ensure the confidentiality and security of the Deposit Materials. When necessary or desired by the parties, EscrowTech India can conduct technical verification, testing or other services relevant to the archive. The cost of the Archive is miniscule in comparison to the cost or loss involved if you find yourself in need of an archive after it is too late. The parties settling a dispute relating to a software development and license agreement archived software (including source code), documentation of trade secrets, and other materials to precisely define the critical subject matter of the agreement. Any claims of future infringement (or non-infringement) by a party of the other party’s rights can be judged with reference to the archived materials. A venture capitalist required an archive of CD ROMs of software, invention descriptions, and documentation from a software company to document the intellectual property of the company in which an investment was made. Two parties archived their respective passwords with EscrowTech India. The settlement of a trade secrets case included the archive of trade secret materials with EscrowTech India.